Also bringing the funk this week is Ms. One herself! Well known for her unorthodox soundscaping and inspired traditional African song structuring combined with funk and hip hop, her cameo performances with artists such as Dudley Perkins, Madlib, Wildchild, and Erykah Badu have helped her come into her own as an artist, with growing critical acclaim, fanbase and opportunities. 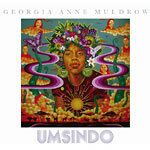 Umsindo (which means sound in Zulu) is her second full length under her name but that's certainly not counting out her other full length collaborations and projects under different monikers. The album tells a story, with subject matter ranging from world politics to the metaphysical sciences all infused with her many musical inspirations again ranging from her unique vocal stylings, playing her own instruments, funk, hip hop, soul and organic world music. If you thought her previous more recent work was a little too different, you're right, they were supposed to be...but don't worry, fans of her 2006 Stones Throw release, Olesi, will find that this is a return to Earth.